I have finally started sanding Sprout's old fashioned desk. Hooray! 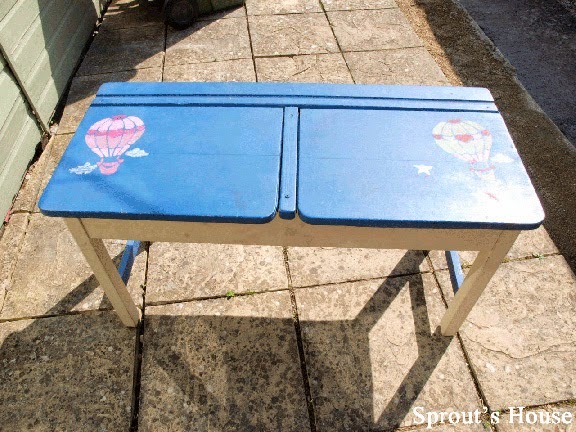 Those of you who have been following our adventures for a while may remember that this was one of the presents we bought for her third birthday and I had grand plans to renovate it over the summer holidays - last year! and here she is now! Isn't she so much more beautiful now all that paint has been removed? There is still a little bit more sanding to do, but hopefully I'll finish that over the weekend. Now comes the difficult part - what to do with the desk next? I am quite keen to continue experimenting with Annie Sloan's chalk paints (I used them for the Memory Boxes) and of course Sprout is very keen on a pink theme. 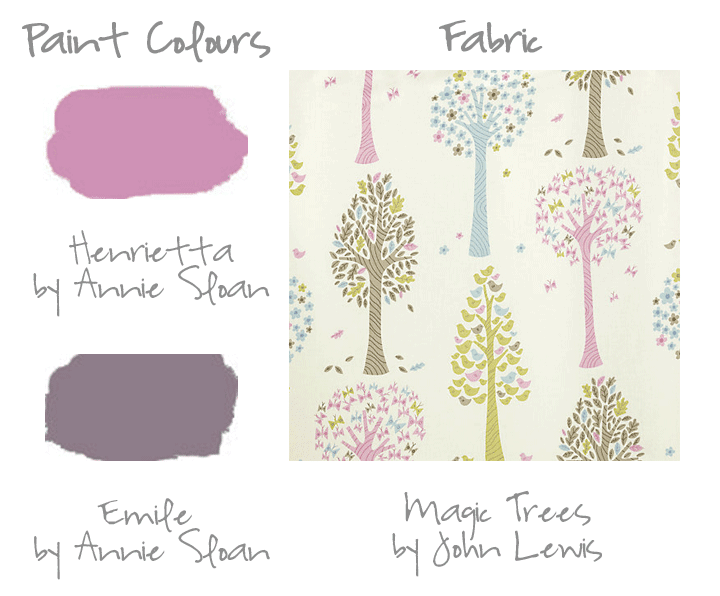 She has approved two colours so far which luckily tie in with the curtains she already has in her room. 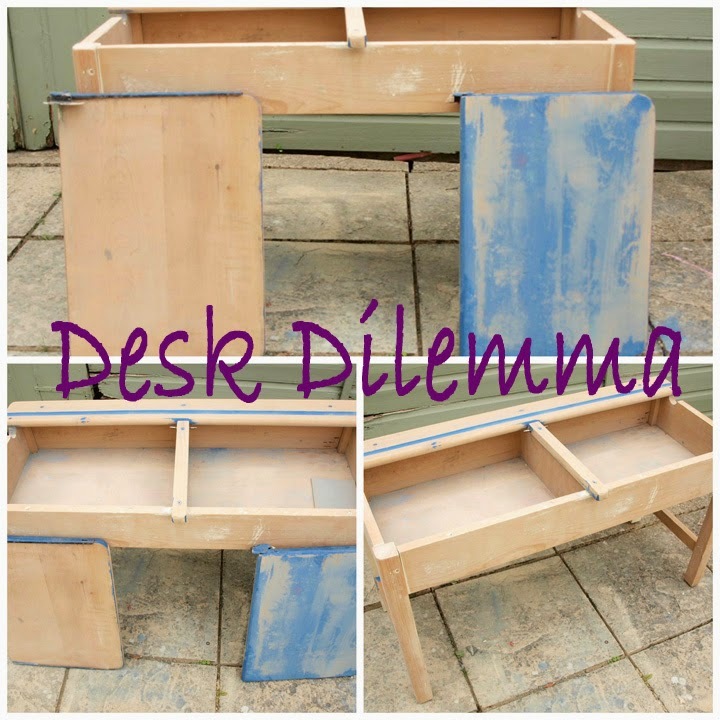 However having seen how beautiful the desk is underneath all that hideous paint, I am wondering whether it would be a shame to cover up the wood again. Perhaps just a layer or two of wax would be enough? Let me know your thoughts and have a great weekend. Thanks for sharing at Share it Sunday. Shared today on FB. Have a great week. How about the wax or stain on the outside, and a pop of pink inside the drawers? Thanks for linking up with us at Share it Sunday. Shared on FB page. I think you should use the grey chalk paint with the fabric inside. That would be cool and a good surprise. I'm looking forward to seeing how it all turns out in the end, when you decide what you want to do. Thanks for sharing! I like the colors you picked for her desk. How long did it take you to pick them out? It takes me at least a month to pick out colors that I can live with and that I think fit my style. I would like to invite you to post a link on the blog hop I am hosting. Have a great day. Looking good! I like the pink personally, and you call always re-strip it again in the future if she grows out of it.